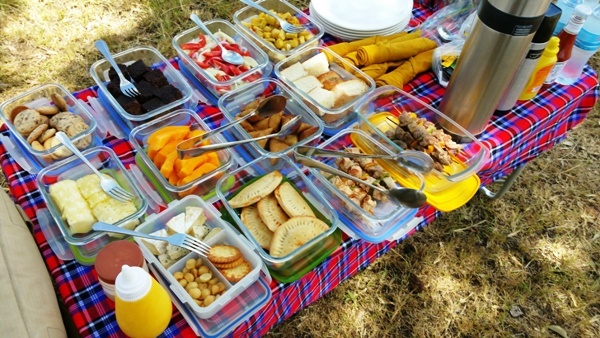 The Land Cruiser was stocked with cold water and our picnic lunch and off we drove. Near the hotel a lot of the land had been freshly burned. 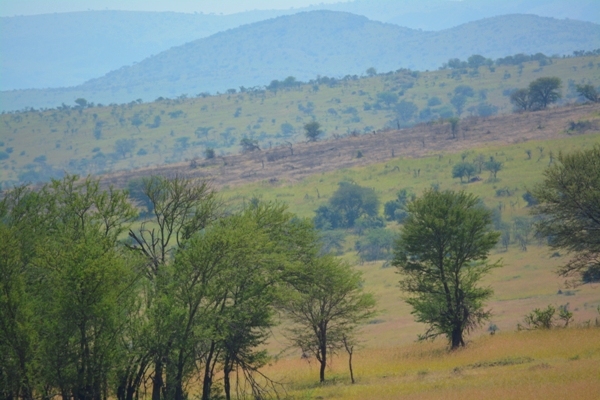 The park rangers run control burns which causes the seeds of the grass to fall into the soil. Soon the fresh green shoots sprout and the animals enjoy these fresh young shoots. 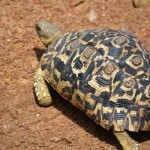 For example the Zebra migrate according to the grass cycles. 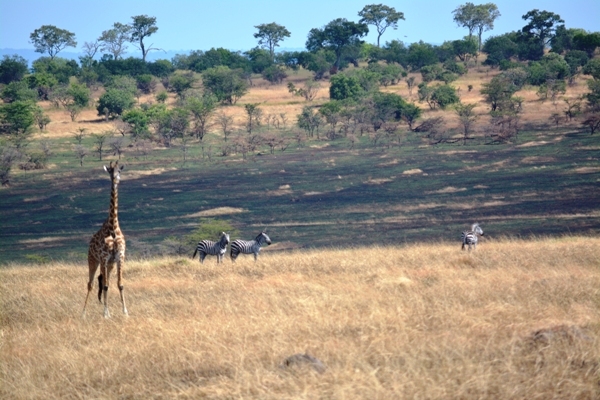 The short grass is a safer area for bearing calves, out in the open area where they can see predators coming. The short grass contains more calcium for good milk production and calcium for the newly born calves. A baboon troop was crossing the road ahead of us. 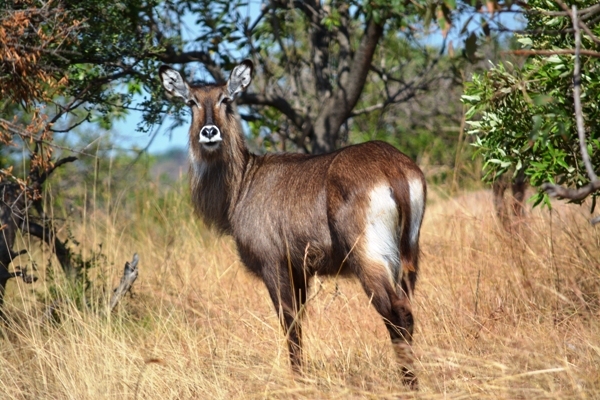 Then, we added a new animal to our viewing list a Defassa Water Buck, amazing. 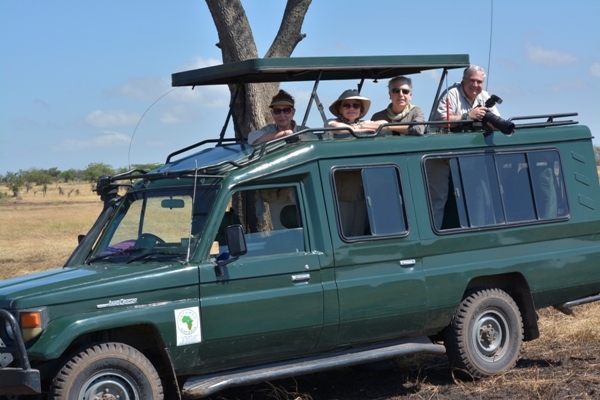 The animals here in the Serengeti are a lot more vehicle shy then they were in the Ngorongoro crater and they scatter generally at the sound of us. Did you know that elephants spend 18 hours a day grazing, 2 hours sleeping, and 2 hours walking around and bathing or wallowing in mud holes. Elephants are Matriarchal. No Elephants today. Scattered boulders started to appear with outcroppings of rock hills covered in small bushes. Like the rock outcropping in The Lion King movie. Cliff Springers (another little gazelle type animal) darted out as did a family of mongoose, also many warthogs. So ugly they are cute. Guess how you say warthog in Swahili? Pumba. 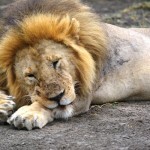 Lion? Simba. The terrain grew rockier. The driving was getting tricky and Beni had to use all his skill to negotiate some mud holes and rocky streams we crossed. 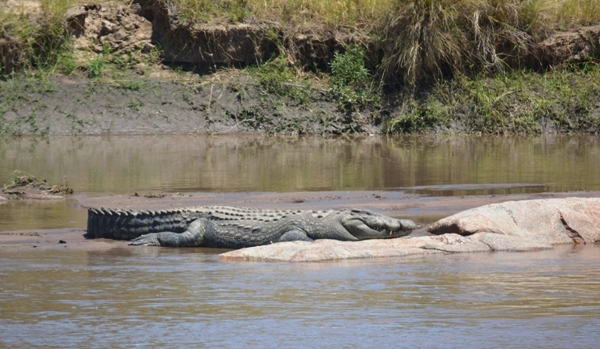 We were growing ever closer to the Mara River. Finally we came to an Overview of the river on some rocks and it was spectacular. 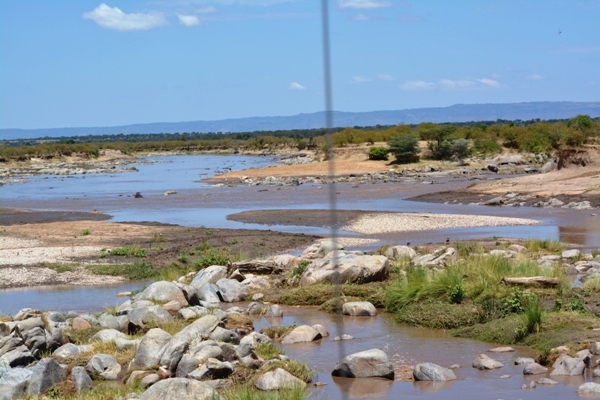 Below us meandered the flowing Mara River, with mud bars and huge boulders here and there, ponding up some water while in other places the river gushed. 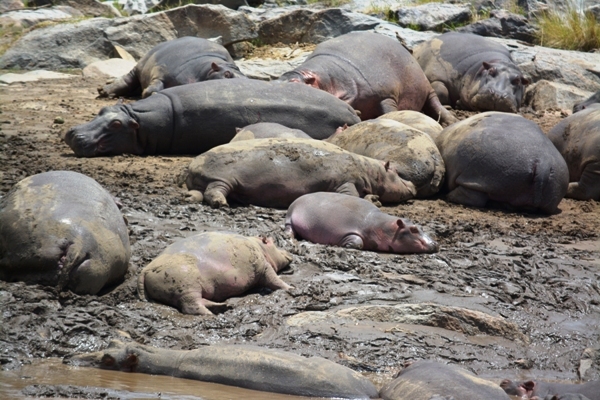 Hippos were down below. We watched for a while, the morning chill had given way to a hot afternoon, very humid in the 90’s. 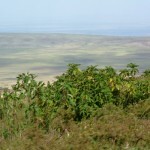 We drove along the cliff above the river and every so often we veered in closer, right to the edge and looked below. 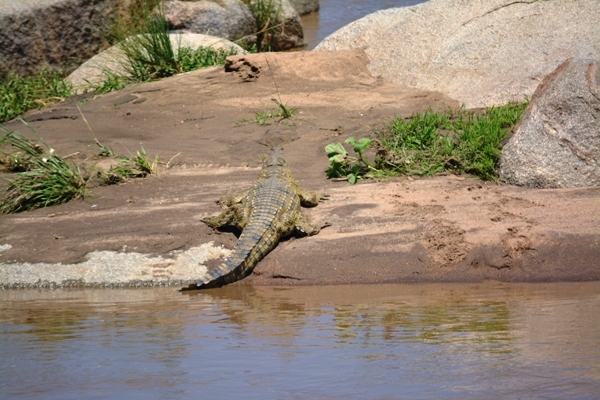 A huge crocodile was sunning himself on a rock and look another smaller one! Don’t swim here. 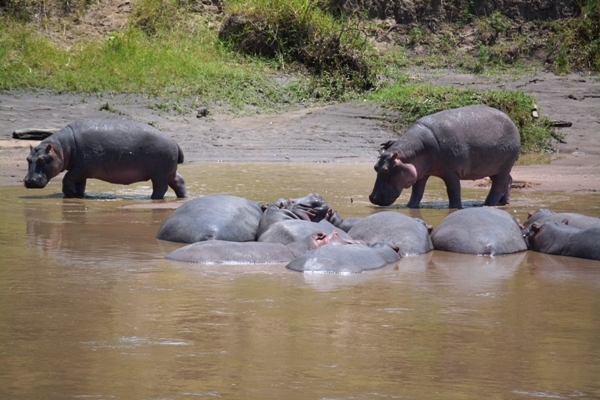 The hippos were in huge groups with their new babies. The huddle together in the water to protect the babies from crocodiles and many were sunning themselves on the mud flats for a lovely hippo afternoon. 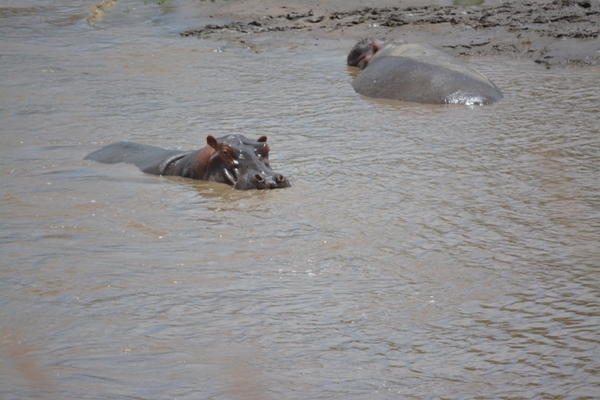 They were making hippo noises and having a hippo of a time. 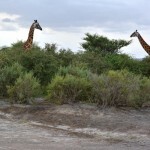 We stopped at several more spots but finally it was time to find a shade tree and have our alfresco lunch in the Serengeti plain with zebra frolicking over there, a hyena stocking them or us I was not quite sure, and hippos calling and snorting in the background. Our lunch was fun but it was getting very hot, time to head back to the lodge. 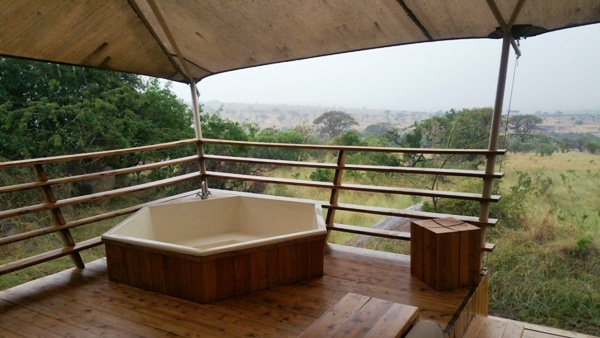 When we arrived back our butler had filled the hot tub on the balcony of our tent. I ordered an iced coffee and Neesa the butler delivered a covered dish of canapés. 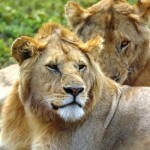 What a wonderful way to banish the dust of the Serengeti game drive and watch the late afternoon thunder clouds role in. 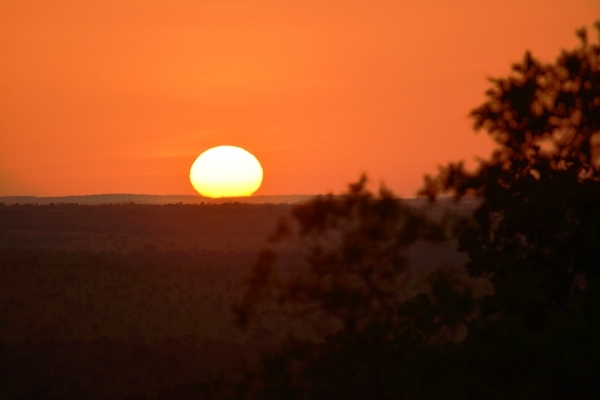 AT 7 PM the sun dipped below the horizon, after all at the equator the sun sets at 7 and rises at 7. The afterglow of red orange on the darkening clouds was beautiful. Again we prepared for dinner and headed up to the main tent for another elegant dinner. Turn down service happens while at dinner.